I had a bunch of people ask for this (sorry it took so long! 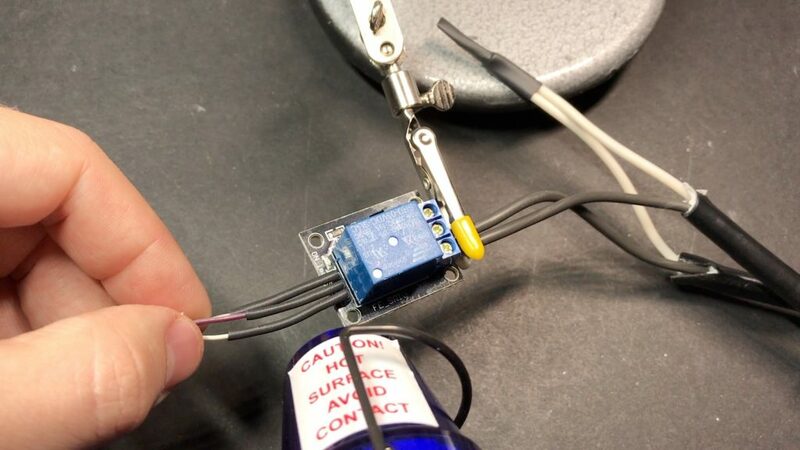 ), so here it is: How to make your own Lamp Zapper! This is a fun, quick project that could you could probable do in a weekend. 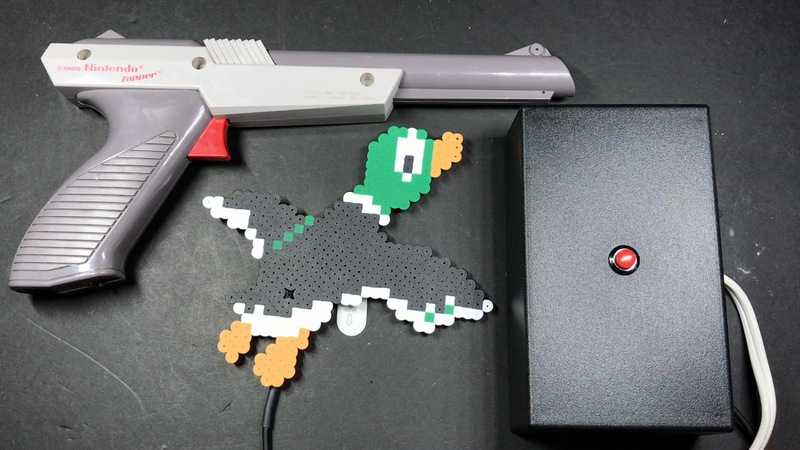 When you’re done, you’ll be able to turn on/off a lamp or other small device using an NES Zapper gun! 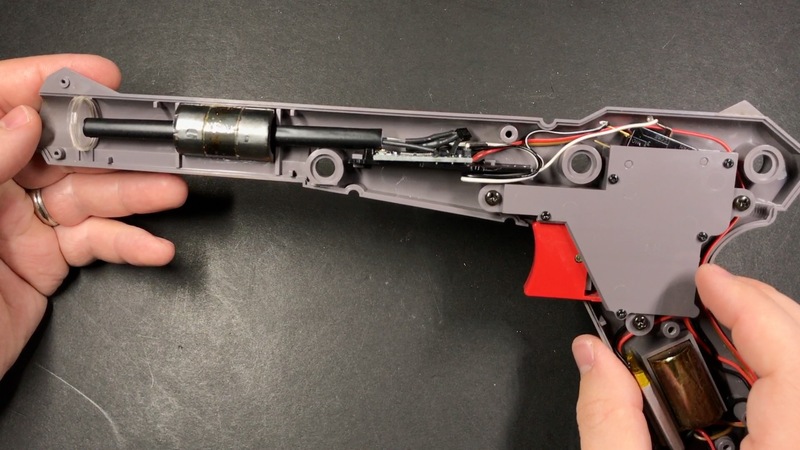 An NES Zapper gun (I used an original one. There are knockoffs but I’m not sure what they look like on the inside. All we’re using is the trigger though, really). 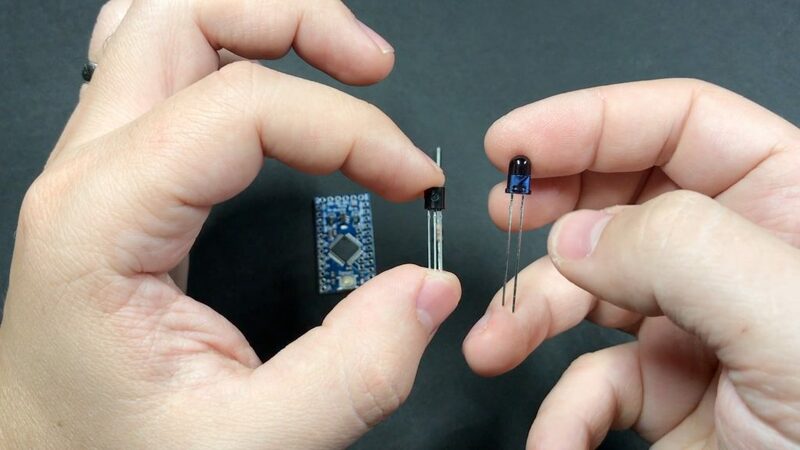 Pretty much any Arduino board will do, all we need is a PWM pin. I used this particular board because they come in packs of 5 for $16 on amazon. 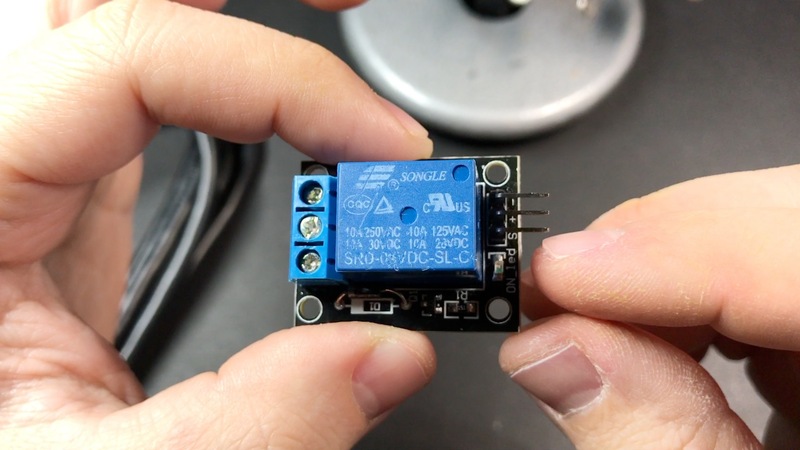 This particular one doesn’t have a USB interface — you’ll need an FTDI cable (that one should work, though mine is a different brand) to program it. 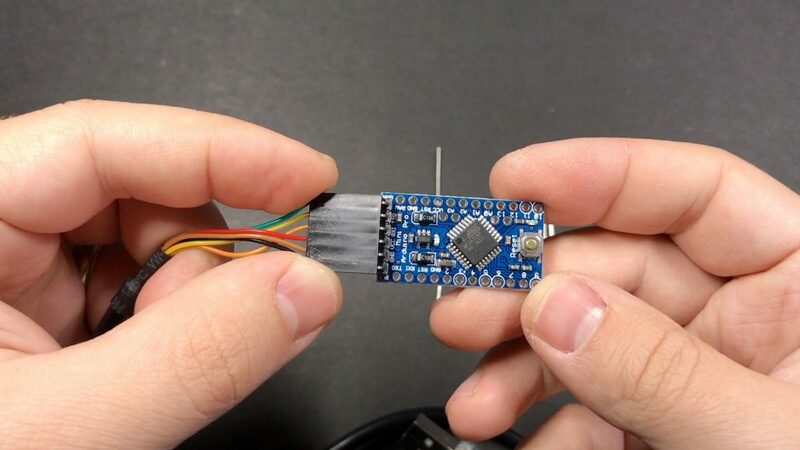 If you don’t expect to do a lot of projects in the future it might be cheaper to just spend a few extra bucks on a board that has USB (this one should work) and save having to get the FTDI cable. Yes, I used several parts from Adafruit, and yes they are a little more expensive. But they are awesome! Consistent quality and great customer service (and no I’m not being paid to say that). You can find equivalent parts on Amazon/ebay if you go looking, though. 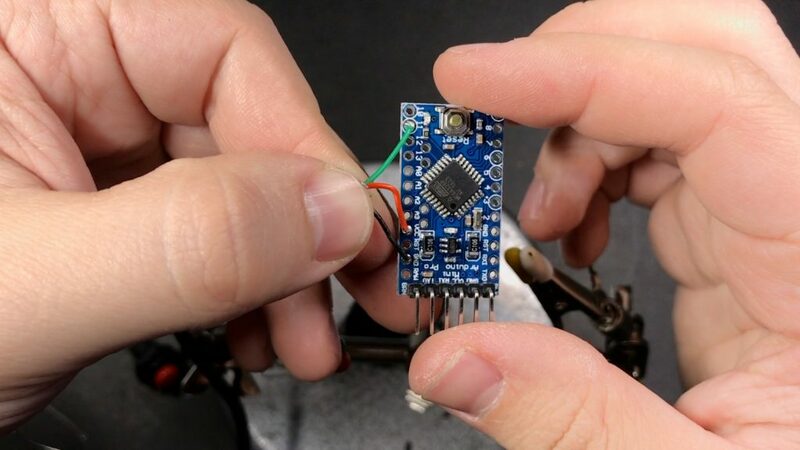 If you’re using the same board I did (without a USB connector), go ahead and solder on the header pins so you can program it with the FTDI cable. 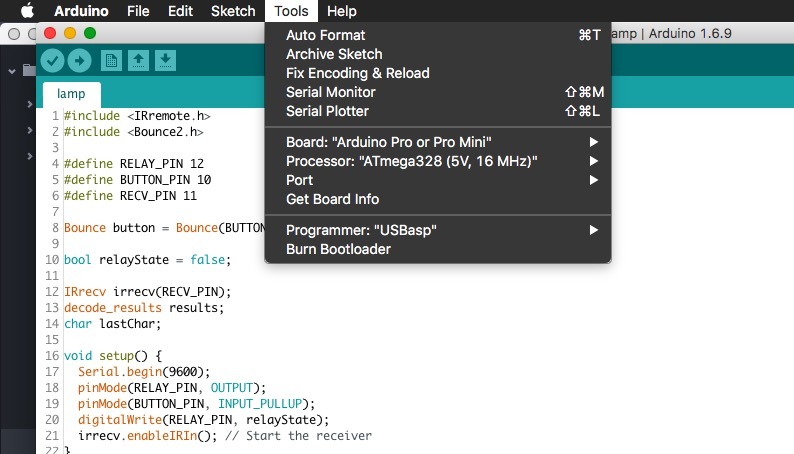 Download this zip file, which contains two Arduino sketches (one for the zapper and one for the receiver), and program the zapper sketch to this board in the Arduino IDE. On mine it was a little tricky to get the timing right: I had to hit the upload button in the IDE and then immediately press the reset button on the Arduino. You’ll also need to make sure you have the IRremote and Bounce2 libraries installed – you can do this by going to Sketch -> Include Library -> Manage Libraries and searching/installing them through the IDE. The way it works is the zapper sketch sends the characters “ZP” whenever you pull the trigger. The receiver watches for those characters, and flips the state of the relay when it sees them. Now connect a couple wires to the bottom to power it (one to ground and one to VCC), nice and long so they can run from the barrel down into the grip. It’s nicer to do it on the bottom so you can still access the header pins should you want to re-program it in the future. 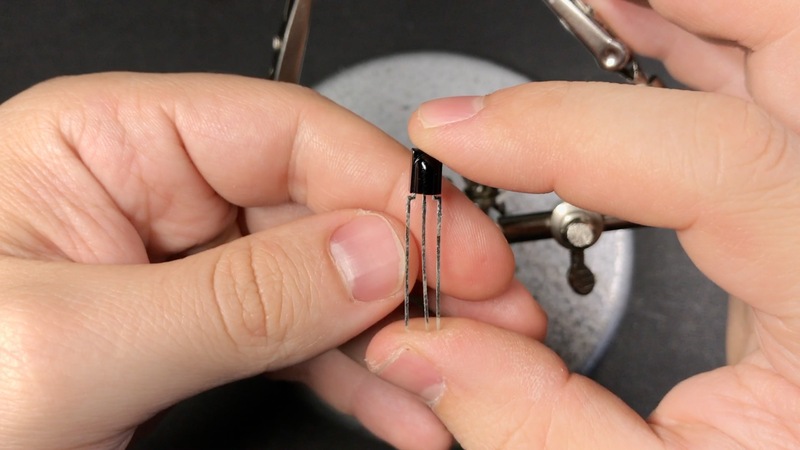 Now we’ll connect the transistor, resistor and LED to the board. You might wonder why we need the transistor. 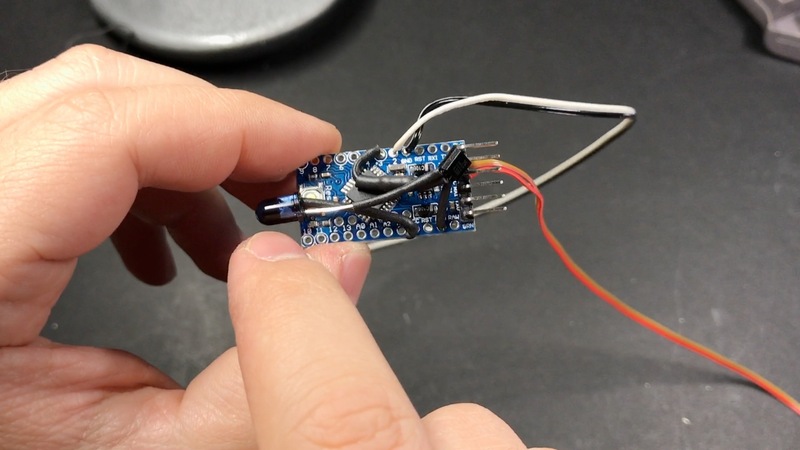 If we were to connect the LED directly to the output pins of the Arduino, it would work, but not very well; the I/O pins on the Arduino just don’t supply enough power. So in stead we’ll hook up a transistor to the output pin, which will then switch on/off power to the LED (which will be connected to one of the VCC pins on the Arduino). 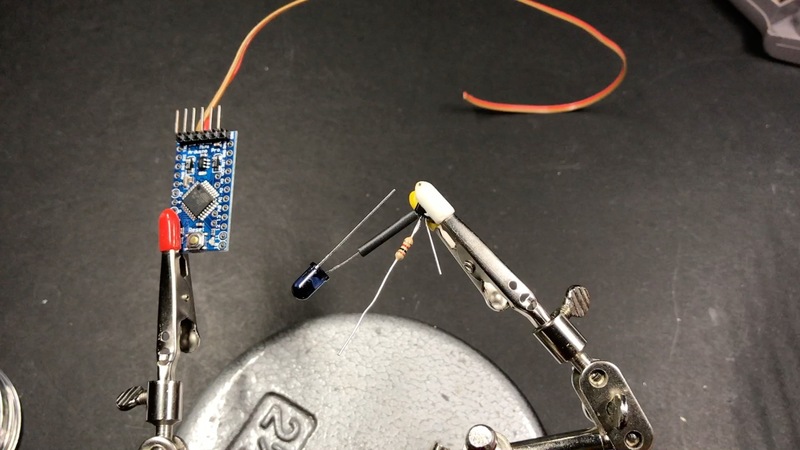 If you’re holding the transistor as shown below, the left pin is ground, the middle pin will be connected to one end of the resistor (the other end of the resistor will be connected to the PWM pin on the Arduino – pin 3 in my case. You may need to update the sketch and use a different pin if you use a different Arduino board), and the right pin will go to the ground pin on the LED (the left/shorter leg below is ground). The positive pin on the LED will go to one of the VCC pins on the Arduino. Be sure to watch the video if that was a little confusing! 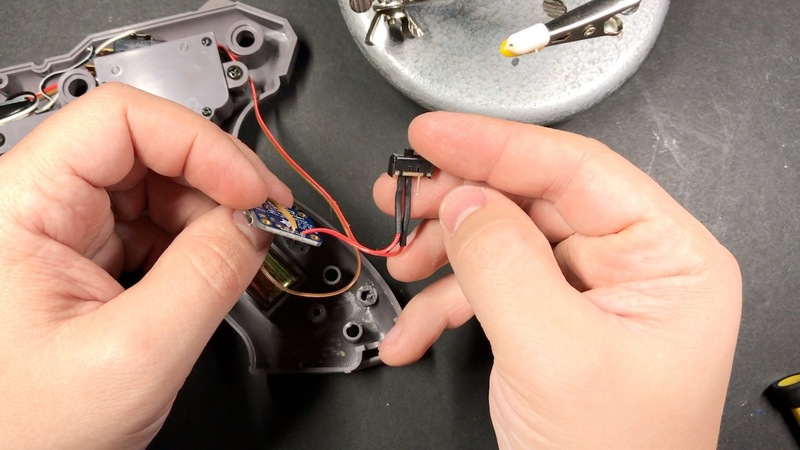 I also went ahead and connected two wires to pin 2 and a ground pin, which will go to the trigger in the Zapper. You can download the STL file so you can print your own if you have access to a 3D printer, and you can also purchase one on the sudomod market. Also remove the cord from the zapper. Disconnect the two wires coming from the trigger, and connect the ones you connected to pins 2 and ground on the Arduino. It doesn’t matter which goes to which. 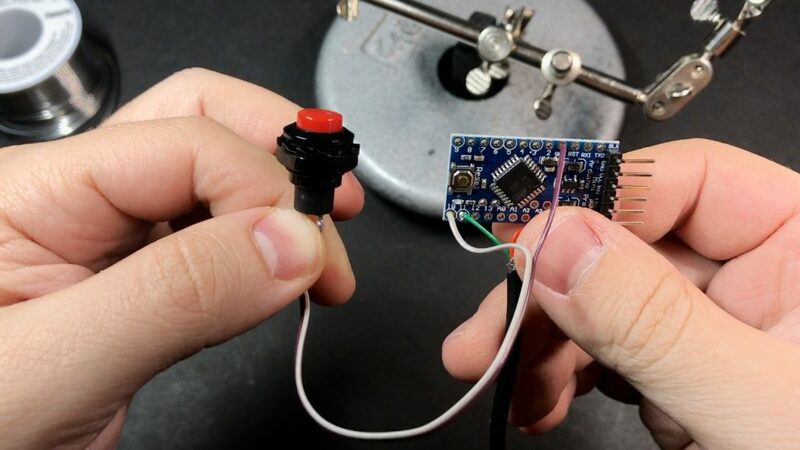 Attach the Arduino to the 3d-printed board (or one you made yourself if you prefer) using a dab of hot glue. 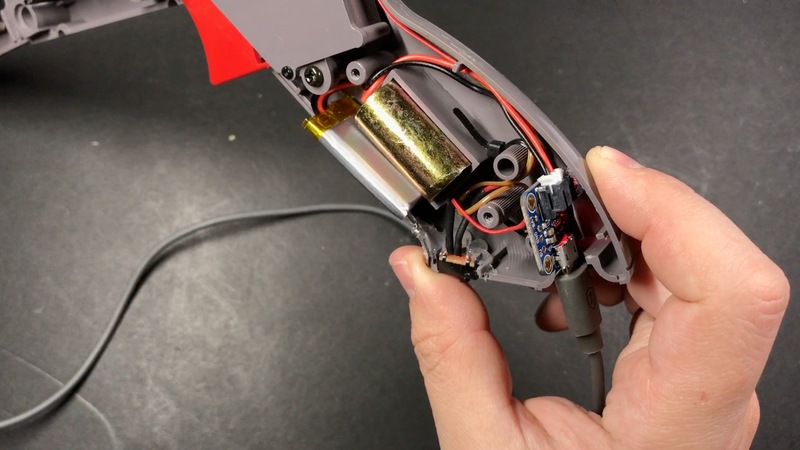 I used a zip-tie to fasten the Micro Lipo to the gun, with the micro-USB port aligned with the hole that the cord was coming out of in the bottom of the grip. It works well enough for me, but if you can’t get it to sit in there securely you may want to reinforce the board with a bit of epoxy. 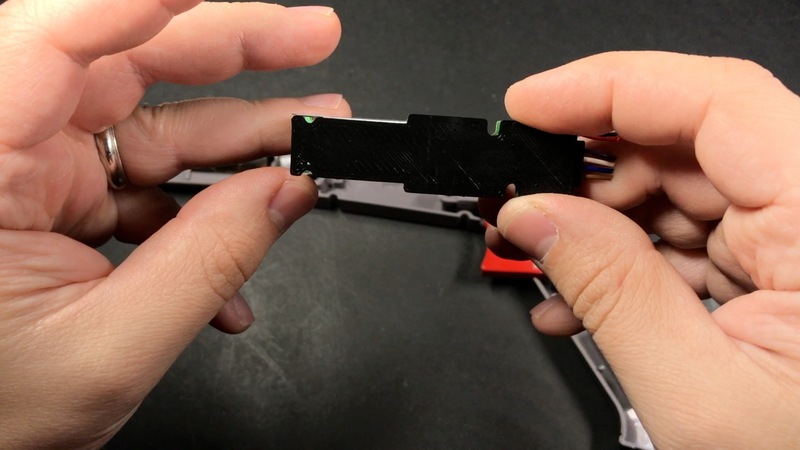 Cut a notch in the bottom of the grip for the switch, and glue it in place. Before we connect the battery, go ahead and plug in a USB cable and make sure the board powers on and you see the LED on your Arduino blink when you pull the trigger. 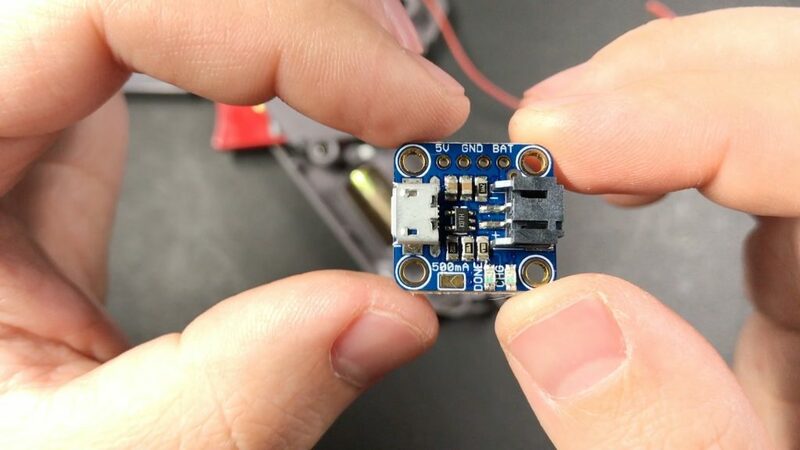 Then plug the battery into the charging board and make sure everything looks good there as far as running off the battery and charging. The battery can go right in front of the weight in the grip. I held it in place with a piece of double-sided tape. Now, one last thing for the Zapper: Initially when I put mine together, I found that it would work pretty much regardless of where the gun was pointed. 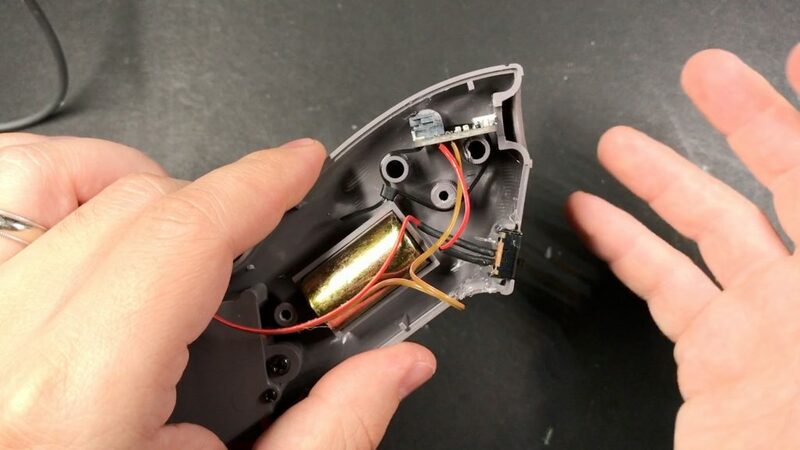 I found that light was leaking out of the sides of the zapper (this may be more of a problem for the orange zappers than the gray ones, since they are a little more translucent). To solve this, I wrapped a drinking straw in some electrical tape and placed it over the LED to block light from going anywhere but out the front of the barrel. Silly as it sounds, it works great! 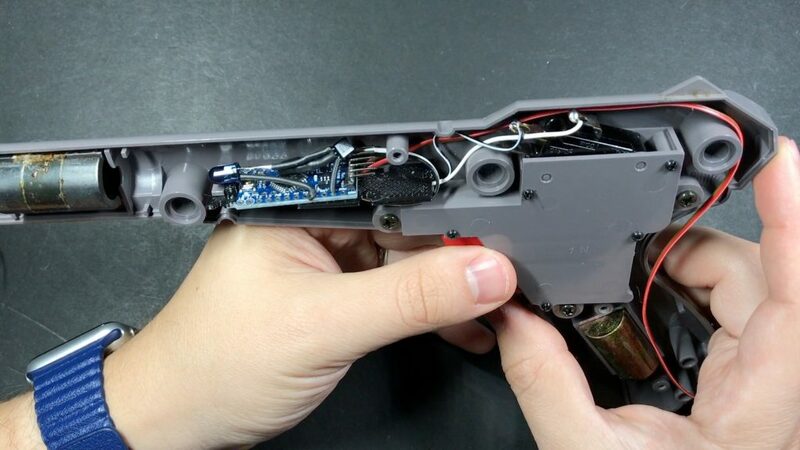 After doing that, the gun has to be pointed more or less directly at the sensor in order for it to work. That’s it for the zapper! Put it back together. 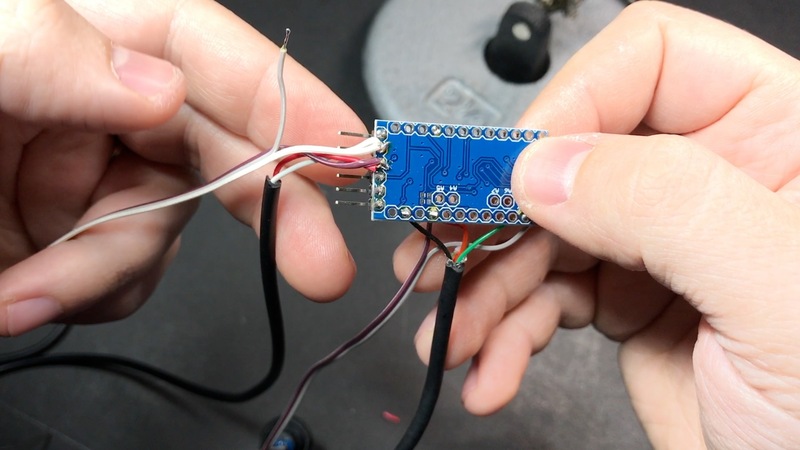 Program the lamp sketch to your second Arduino board. 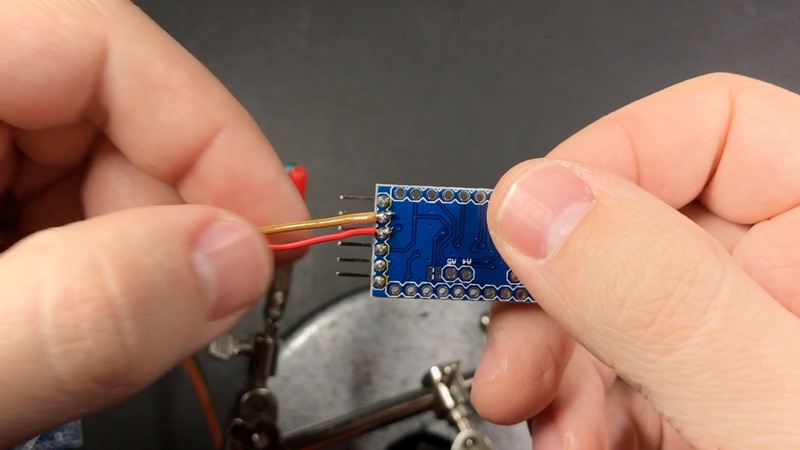 Now we’ll connect the IR receiver. When holding it as shown below, the left leg goes to pin 11 on the arduino, the middle pin is ground, and the right pin will go to one of the VCC pins on the Arduino. If you have a different receiver than the one I got, your pins may be different. 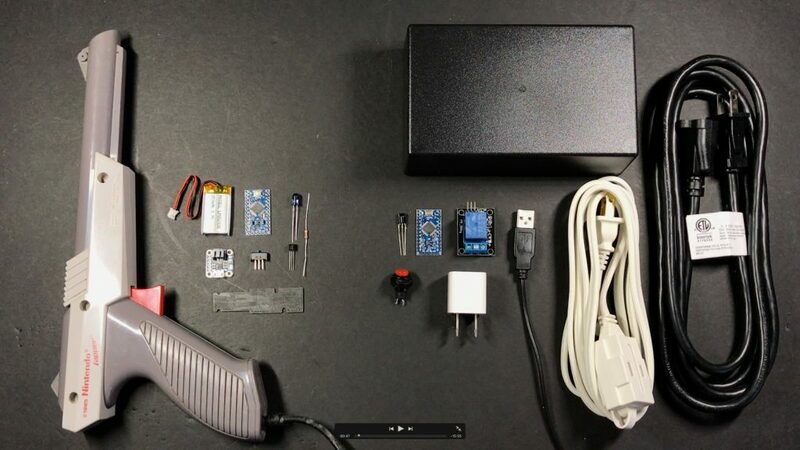 Since we’ll be chopping up the USB cable and only using a small piece of it to power the Arduino, you can use the rest of it to extend the IR receiver away from the actual box. Heat-shrink tubing is super handy here. Now wire up the button that will go on the side of the project box. It goes to pin 10 and another ground pin. Just to be clear: we’re making something that plugs directly into a power outlet on your wall, which is inherently dangerous. If you aren’t comfortable or experienced with this sort of thing, you should find someone to help you who is. I’m showing how I did this, which has worked great for me so far, but proceed at your own risk! 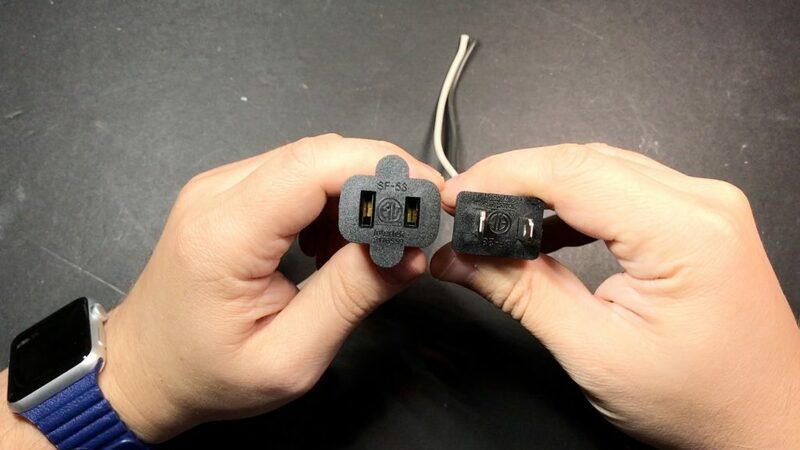 When you look at a US outlet head-on you’ll see the left slot is a little thicker than the right one — this is called the neutral side. 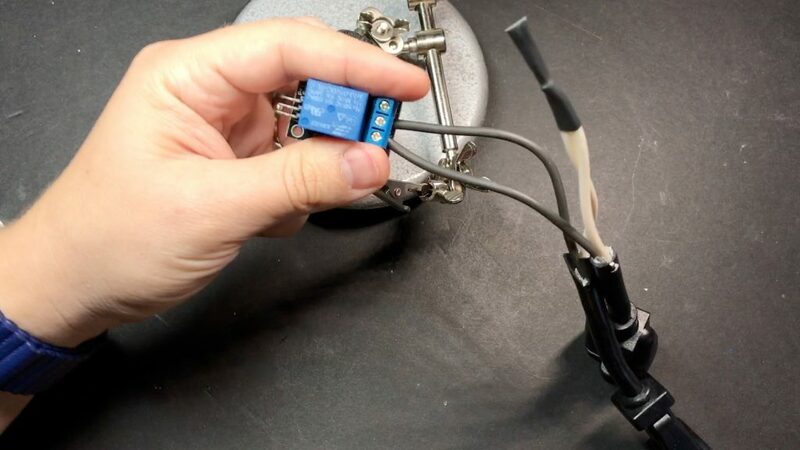 We’ll connect both the neutral wires and secure it with some heat-shrink tubing. 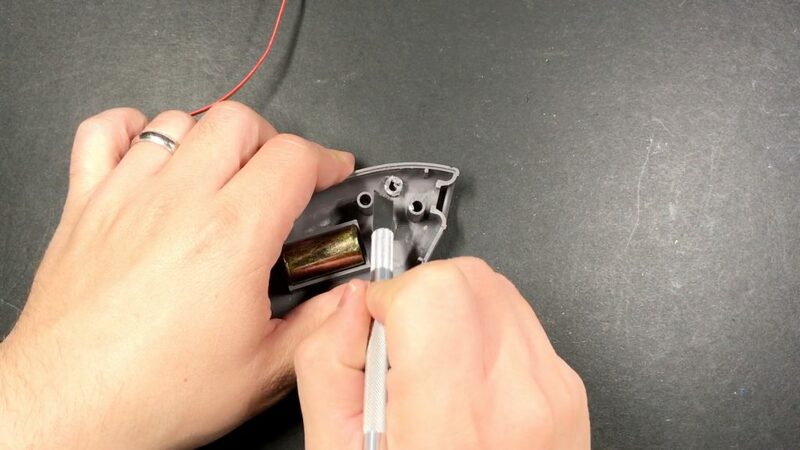 The right side is called the “hot” side – these are the two wires we’ll insert in to the slots on the relay, which will open/close the circuit (thus turning on/off the lamp). 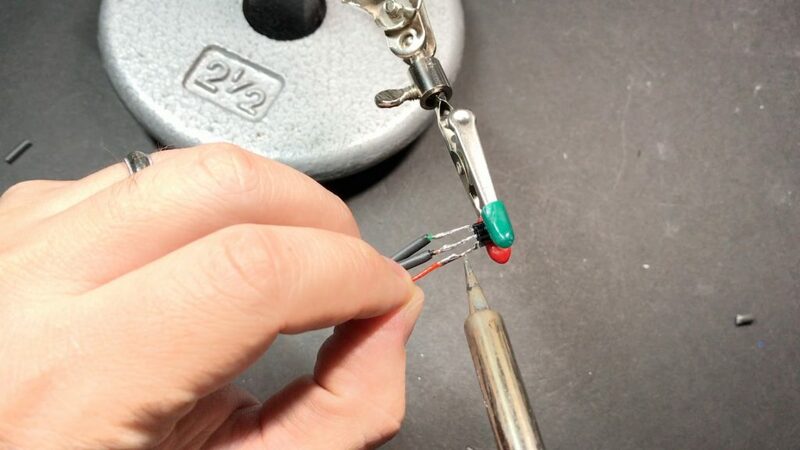 It helps if you twist the ends of the wires and add a bit of solder to them to prevent fraying and make them easier to insert into the relay. Tighten the screws and give it a good tug to make sure they are in there securely. The he other is a 6″ or so set of 3 wires that will go to the S, +, and – pins on the relay (again, pin 12 for the signal (S) pin). Now we just need to put everything in the project box! I used a Dremel to cut a few holes in the side of mine for the black extension cord for the lamp to plug into, the other extension cord providing power to everything, and the extension wire for the IR receiver. 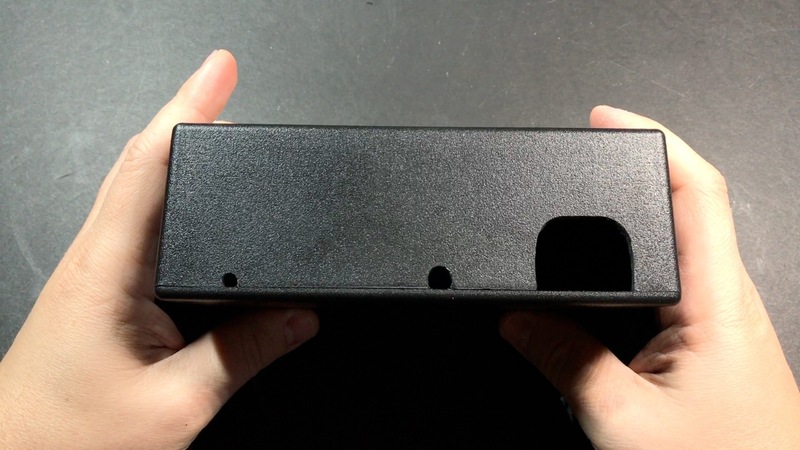 I also put a hole on top for the manual trigger button. 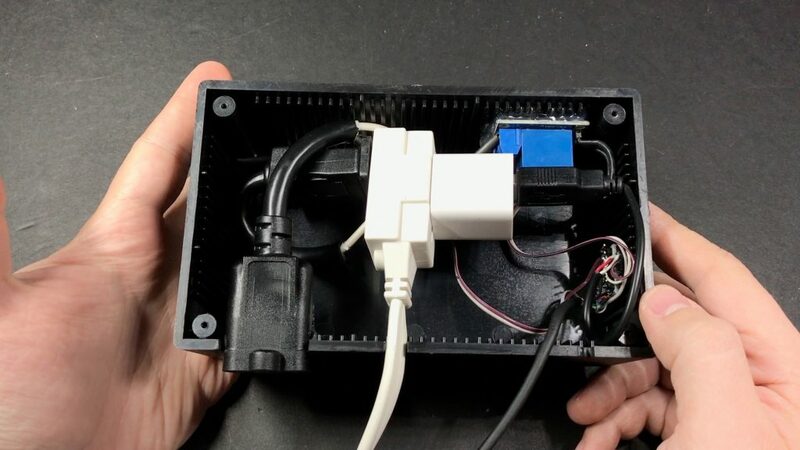 I used 2-part epoxy to attach the relay and Arduino board to the sides of the box, and a bead of it on either side of the end of the outlet that the lamp plugs into to reinforce it. I do not recommend using hot glue for this – you’ll want something stronger and longer-lasting like epoxy. 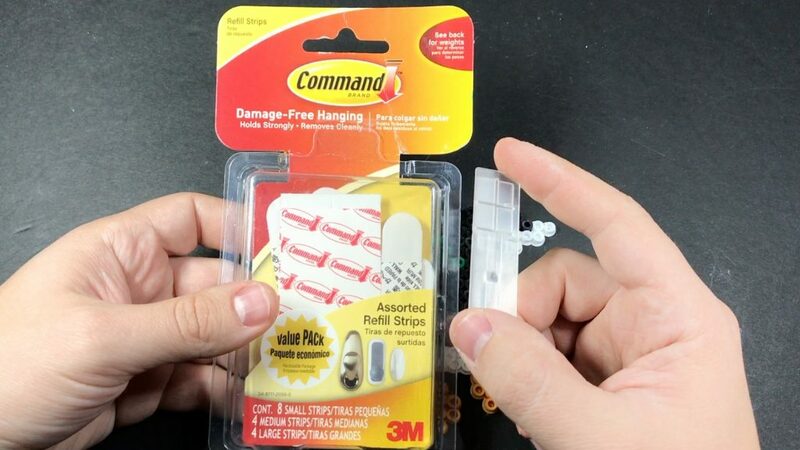 I used a Command Strip (along with the plastic backing from one of the hooks) to make it easy to stick to a wall. Works great! 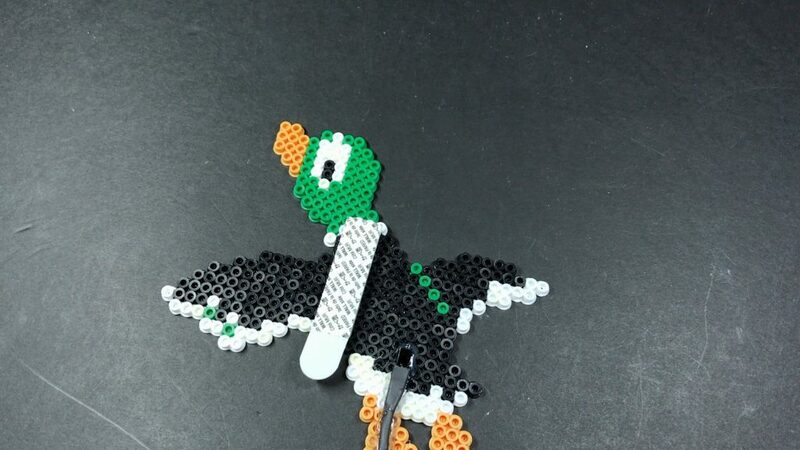 For the actual Perler design I used a sprite sheet from The Spriters Resource, and just picked one I liked. 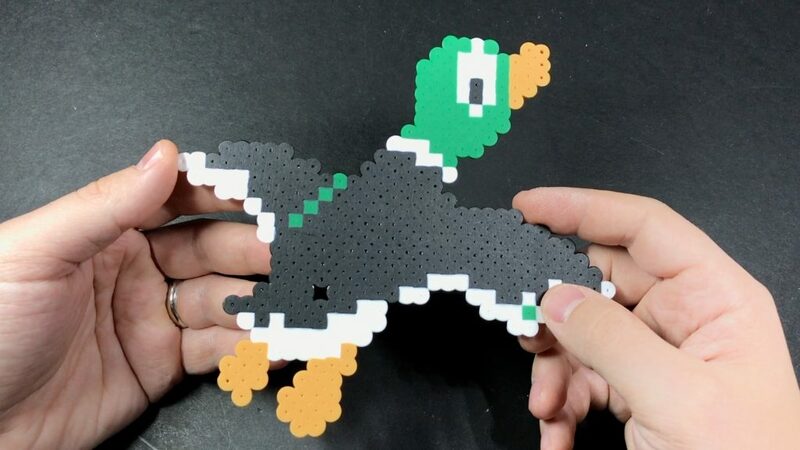 For tips on how to do Perler, there are a ton of great channels on Youtube – Pixel Art Shop is one of them. And that’s it! If you have any questions, need help or just want to show off one that you made, be sure to stop by the forums!